The Boston Harbor holds plenty of surprises but Courageous Sailing Center holds much more being off of the Boston Harbor. Despite the fact that I have worked for Save the Harbor for three years and this is my first time working Courageous Sailing Center I am very pleased. Usually people expect so much of things but are not satisfied with the outcome I came into Courageous hoping the best and the first day I went home with a male lobster. 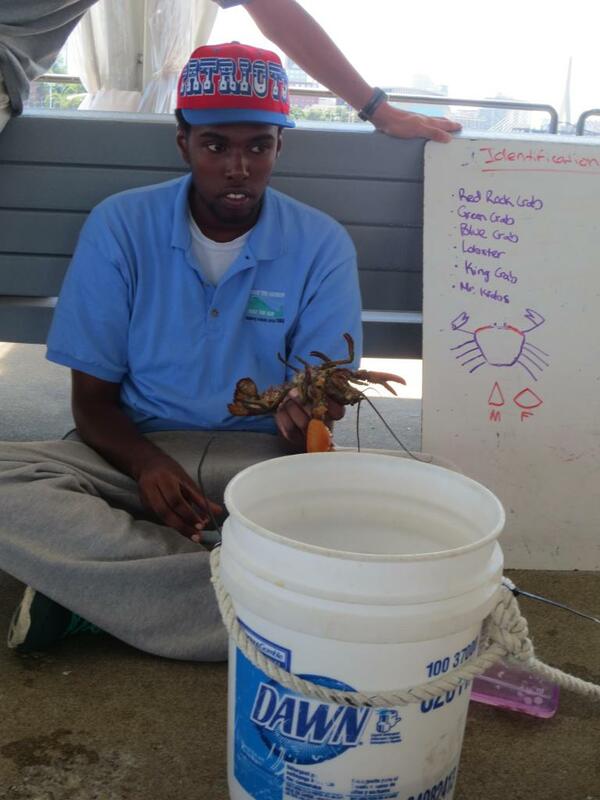 I learned so much like how we can't eat female lobster because they carry sperm for up to a year, carry eggs, and over fishing is really a big problem in the Harbor. We caught four lobster, but only one was legal. The legality of lobster is based off the measurements of its carapace. If the carapace is less than 3 1/4" it isn't able to be taken out of the harbor and eaten. Also male lobsters are the only lobsters that The Fishery Regulations allow us to eat. Many lobsters can be differentiated between male and female by the texture of the swimmerets closest to their head, if they are rough and ridged they are male, tender they are female. I took a male lobster home and made a good dinner for myself. Although I took it home I wasn't able to eat it due to my run in with mother nature and becoming sick and obtaining a swollen throat. It was an amazing first day and am looking forward to the rest of the week!